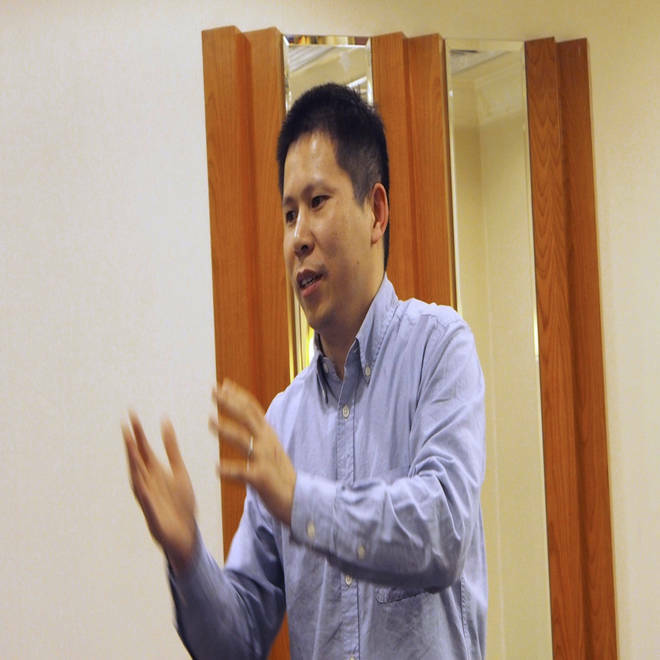 Chinese rights advocate Xu Zhiyong speaks during a meeting in Beijing in this file handout photo dated March 30, 2013. One of China’s most prominent human rights advocates was convicted Sunday and sentenced to four years in prison after campaigning for children from rural areas to be educated in cities and for officials to disclose assets. Xu Zhiyong's jailing will send a stark warning to activists that the Chinese Communist Party will crush any challenge to its rule, especially from those who seek to organise campaigns. It also diminishes hopes for meaningful political change, even as China pledges to embark on economic reforms. The Beijing No. 1 Intermediate People's Court found Xu guilty of "gathering a crowd to disturb public order," the court said on its official microblog. Xu was tried on Wednesday. The U.S. State Department said in a statement that it was "deeply disappointed." "We are concerned that Mr. Xu's prosecution is retribution for his public campaign to expose corruption and for the peaceful expression of his views," said Daniel Delk, second secretary for the political section at the U.S. embassy. Delk said "we call on Chinese authorities to release Xu and other political prisoners immediately." The U.S. Embassy sent two diplomats to Xu's trial on Wednesday, joining 15 other Western diplomats, although they were only allowed into a room adjacent to the courthouse and were not allowed to observe the trial. Xu's lawyer Zhang Qingfang said he will meet Xu within the next two days to get his opinion on whether to lodge an appeal. "He said (in court) that the last remaining dignity of the Chinese legal system has been destroyed," Zhang told reporters. "It's not that we can't bear this result but that, fundamentally, the guilty conviction is illegal, is unreasonable and unfair," he said. There were chaotic scenes outside the court as police shoved and harassed foreign reporters. Zhang was briefly taken away in a van by police after the hearing. He said police were still tailing him after he was released. A police van drives past the No. 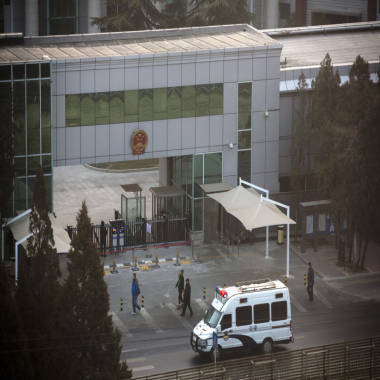 1 Intermediate People's Court, where legal scholar and founder of the New Citizens movement Xu Zhiyong appeared for his verdict in Beijing Sunday, Jan. 26, 2014. The government has waged a 10-month drive against Xu's "New Citizens' Movement," which advocates working within the system to press for change. Hundreds of Chinese citizens have participated in activities related to the movement, according to rights activists. "This is a shameful but sadly predictable verdict. The Chinese authorities have once again opted for the rule of fear over the rule of law," Roseann Rife, East Asia Research Director at Amnesty International, said in a statement. "The persecution of those associated with the New Citizens Movement demonstrates how fearful the Chinese leadership are of public calls for change," she said. China has detained at least 20 activists involved in pressing for asset disclosure by officials, although not all are from the New Citizens' Movement. Two activists stood trial on Thursday in Beijing and four others will be tried on Monday. Three went on trial in December and face more than 10 years in prison if convicted. "Instead of 'putting power' within a 'cage of regulations,' as Xi Jinping has promised, the new leadership appears to be more interested in consolidating power," Brad Adams, Asia Director at Human Rights Watch, said in a statement. "Staging show trials of critics is wholly at odds with Xi's self-proclaimed reformist agenda," he said. Through his online essays and Twitter account, Xu pushed for officials to disclose their assets and also campaigned for the rights of children from rural areas to be educated in cities, where many live with their migrant worker parents. Xu's trial is China's highest-profile proceeding against a dissident since 2009, when Nobel Peace Prize laureate Liu Xiaobo was put on trial for subversion after he helped organise the "Charter 08" petition urging the overthrow of one-party rule. Liu was jailed for 11 years. During Xu's trial, the court rejected the 68 witnesses the defense had applied to testify. It also barred diplomats from attending the trial and security forces roughed up foreign reporters outside the courthouse. "I'm sad, words fail me. This is a great tragedy," said rights lawyer Teng Biao, a close friend of Xu. "In his promotion of the 'New Citizens' Movement' and other human rights activities, none of it constitutes a crime, so his trial and sentencing have no legal basis." Du Guowang, an activist who was given legal advice by Xu in 2011 on equal education rights, said police have tailed him for nearly a week in a bid to prevent him from going to the courthouse to support Xu. "They want these four years to prevent Xu Zhiyong from speaking," Du said. "Because Xu Zhiyong's words represent the masses and he's got relatively high recognition by society. He speaks up for the bottom rungs of society." This report includes information from NBC News' Eric Baculinao.